You can build a tomato cage yourself out of inexpensive materials that will result in a much taller and more substantial cage than the cheap lightweight standard tomato cages. 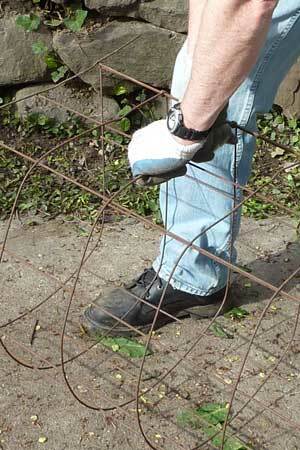 A popular technique for building a very sturdy encircling cage is to make one out of concrete-reinforcing wire mesh with six-inch openings. It makes a great tomato cage. Because the wire is rigid the cage is self-supporting and doesn't need any additional supports. And the wide openings let you reach in and easily pick the tomatoes. A 5-ft. length of the material will produce a cylinder about 18-inches in diameter. Use a longer piece of mesh if you want a wider cage. A two-ft. diameter cage requires a 6-ft. length of mesh. Go to your local big box home improvement store and buy some concrete-reinforcing wire mesh. The wire pictured was previously sitting outside for a couple of years and got rusty. Yours will as well, but that won't affect its functionality. The original size was a 4-ft. by 7-ft. rectangle. 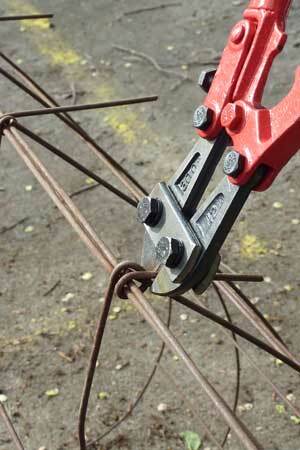 I tried three methods of cutting the thick wires--wire cutters, a hacksaw, and bolt cutters. 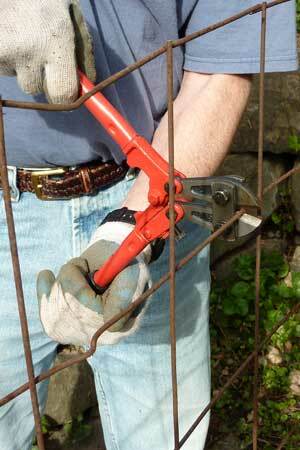 The hands-down easiest cutting method is to use a small pair of bolt cutters like the ones pictured. I bought these 12-in. bolt cutters for just $10. They cut through the wire with very little pressure. If you can't find an inexpensive pair check harborfreighttools.com. Be careful when cutting and bending the wire as it is stiff and wire ends are sharp. Wear gloves. 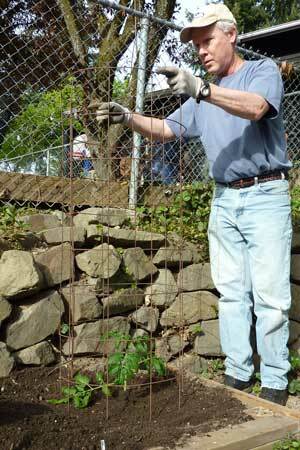 Cut a 5-ft. length and leave 4- or 5-inches of wire protruding in order to wrap the ends around the opposite side. 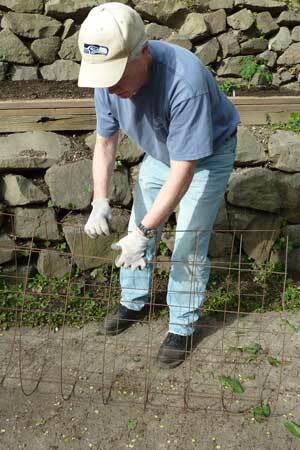 When you build a tomato cage out of this material the trickiest step is bending the stiff wire into a cylinder. Bring the two edges of the mesh together and fasten them by bending the horizontal wires that protrude from one edge around the vertical wires on the other edge. Wrap the protruding ends completely around the opposite edge. Next, cut off the excess wire. Try to cut it close enough that arms and hands won't be exposed to sharp edges when reaching through the cage. Once you've finished fastening the two edges together you're ready to shape it. 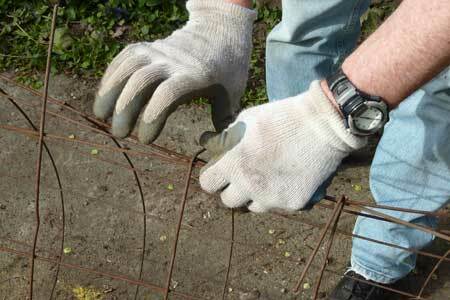 Wearing gloves, work your way around the cage pulling the wires slightly outward until it keeps it's cylindrical shape. Cut the bottom circular horizontal wire off the bottom of the cage so the ends can be pushed into the ground six-inches deep. Set one cage over a single tomato plant. With this large of a tomato cage you won't have to do any pruning. As the vines grow weave them in and out of the openings. When the vines grow tall you can simply allow them to go over the top and down the sides of the cage. Because it's hard to do weeding inside the cage I recommend mulching around the base of the plant to help suppress weeds. You can either weave the branches in and out of the mesh to keep them contained or let the branches extend out and tie up the heavier ones with soft ties. 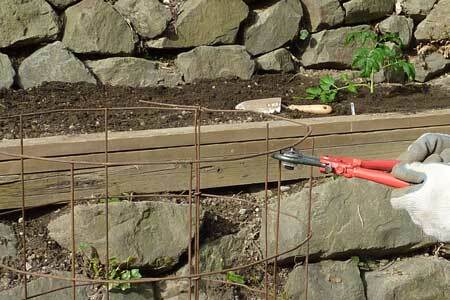 After you build a tomato cage like this you'll have some flexibility in how to use it. Some gardeners wrap these large cages in 6-mil clear plastic to provide a warmer, sheltered environment early or late in the growing season when cold weather threatens. If you do this I'd recommend adding a stake or two to the inside of the cage for extra support; the plastic can turn the cage into a kite! Using this method could allow you to set your plants out four weeks earlier than normal. Keep a close eye on the temperature though; a bright sunny day could overheat your tomato plants. See the article on frost protection for more early-season tomato growing ideas.